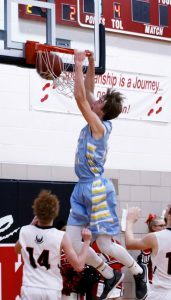 The Lynnville-Sully boys basketball team opened the season with a bang on Tuesday, Nov. 28. 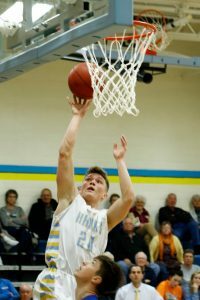 Facing a young, inexperienced Montezuma team in an SICL Conference battle, the Hawks played well all night long and soared to a 73-43 victory. The L-S boys were led by senior Jesse Van Wyk with 20 points, converting on seven of his eight shots. Fellow senior Brevin Hansen was second in scoring with 13 points. Juniors Rylan James and Tyson Vander Linden added in 10 points apiece. Junior Gage Vander Leest puts up a shot for L-S in the game against Montezuma. The Hawks got a great effort on the boards all night long, out-rebounding the Braves 39-19. The leading rebounder was James with 10. Senior Corey McCoy added seven rebounds and Van Wyk contributed six. This was the first game of a busy week for the Hawks as they also played North Mahaska on Friday and East Marshall on Saturday. The Hawks faced another inexperienced conference foe on Friday, Dec. 1, at New Sharon. The L-S boys left with a 61-36 victory. The Hawks were too much for the young Warhawk squad to match. Senior Tanner Foster dunks the ball at North Mahaska last Friday, Dec. 1. The Hawks started the game off strong with a 5-0 run in the first minute by Van Wyk. The Hawks outscored the Warhawks 18-10 in the first quarter. Then, L-S had some foul trouble early so they had to go deep into their bench early. During the second quarter, the Hawks kept up the pressure and forced the Warhawks to commit four more turnovers. At halftime, the Hawks led 36-16. The Hawk offense slowed down during the second half and outscored the Warhawks by only five points. Harthoorn took the press off and rotated more guys into the game. By the middle of the fourth quarter, none of the starters were in the game anymore. The Hawks were led in points by senior Tanner Foster with 14, followed by Van Wyk with 11. Top rebounders were Foster and Van Wyk, both with five. James had two assists. The Hawks committed seven turnovers during the game and won the turnover battle. After two solid wins to start the season, the L-S boys suffered their first loss on Saturday, Dec. 2, at LeGrand, where they played the East Marshall Mustangs. The Hawks struggled on offense to get things working and never led the entire game in the 58-36 loss. The Hawks got off to a slow start against the Mustangs. The Mustangs led the Hawks, 17-11, at the end of the first quarter. In the second quar-ter, the Hawks struggled to maintain pos-session of the ball, committing seven turnovers and only scoring two points. At halftime, the Hawks trailed 31-13. The Hawks had 12 turnovers in the first half, while only forcing East Marshall to three turnovers. After halftime, the Hawks were outscored again, 27-23. They only committed five turnovers in the rest of the game but still struggled to shoot the ball offensively. The Hawks ended the game shooting 12-of-34 from the field and 2-of-10 from the three. However, the Hawks out-rebounded the Mustangs 26-21. The Mustangs won the turnover battle, causing the Hawks to turnover the ball 17 times while only having nine turnovers. Top scorers were Van Wyk and Foster each with 12 points. Van Wyk also led the team with eight rebounds and three assists. The Hawks fall to 2-1 on the year while East Marshall improves to 2-0. L-S was set to play Colfax-Mingo on Tuesday, Dec. 5, and HLV on Friday, Dec. 8. The Hawks looked to remain unbeaten in conference play.